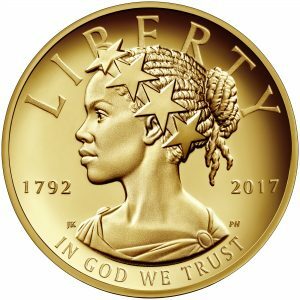 On April 6, 2017 The US Mint started taking orders for the very first gold coin to show Lady Liberty as an African American Woman. This beautiful woman is wearing a crown of stars. This coin was struck in conjunction with the Mint’s 225th anniversary, mintage limited to 100,000 units. These one-ounce, .9999 fine 24-karat gold coins were produced at the West Point Mint. The Lady Liberty has a face value of $100, but each coin is actually worth at least the current gold prices. The Mint has priced the coin at $1,640. 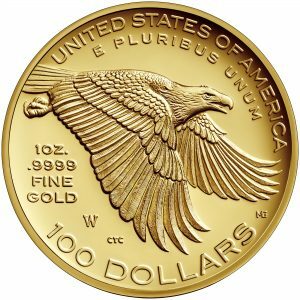 However, once the coins are no longer available at the USMint.gov you will need to purchase from dealers, online and other collectors. 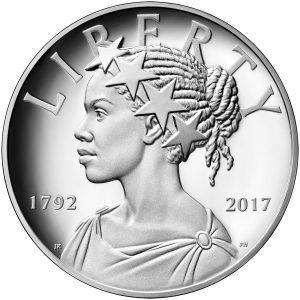 The coin’s head (called the obverse) was designed by Justin Kunz and engraved by Phebe Hemphill, and it shows a profile of Lady Liberty with a crown of stars that holds back her hair. The tail (the reverse, shows an eagle in flight. or you can grab one actually $4.00 cheaper on Ebay. Please note that this coin is part of a series of commemorative coins that will be released every two years. Future ones will show Lady Liberty as Asian, Hispanic and Indian in an attempt to reflect the cultural diversity of our country. Some coin experts have predicted that whereas the gold coins will have the value if gold goes up they will l NOT have collector value. I am not an expert but I believe that if enough people KNOW that these coins watch out! On October 13, 2016 The Special Pictorial Postmark cancellation was issued by the United States Postal Service. 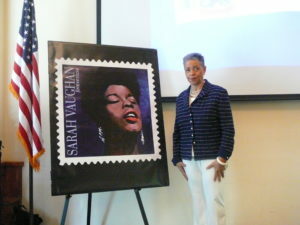 The Forever stamp that received The Newark, NJ’s postmark that day at Pillar College was no other but Sarah Vaughan. This stamp was designed by Ethel Kessler. Bart Forbes painted the image for art which was based on a photograph done by Hugh Bell in 1955. 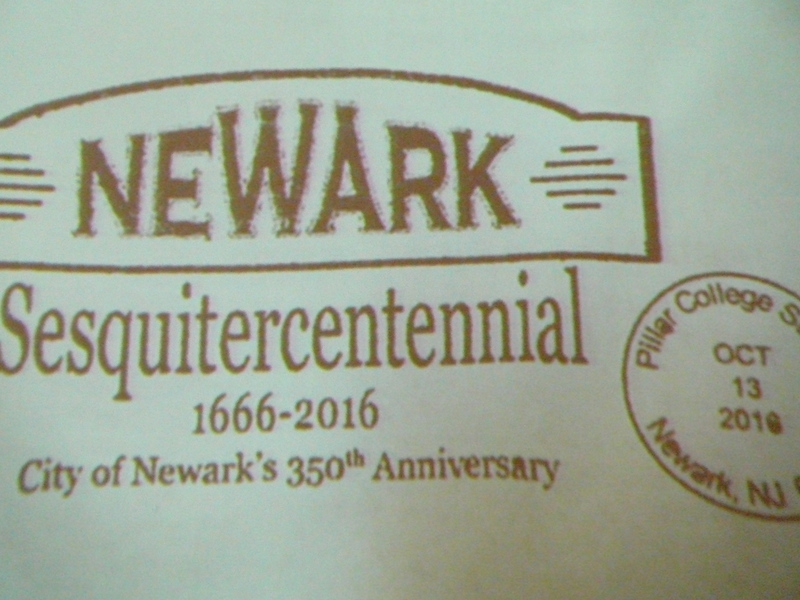 The design of the post mark for the Sesquitercentennial postmark was done by a graphic artst student from Essex County named Jaylen Walker. 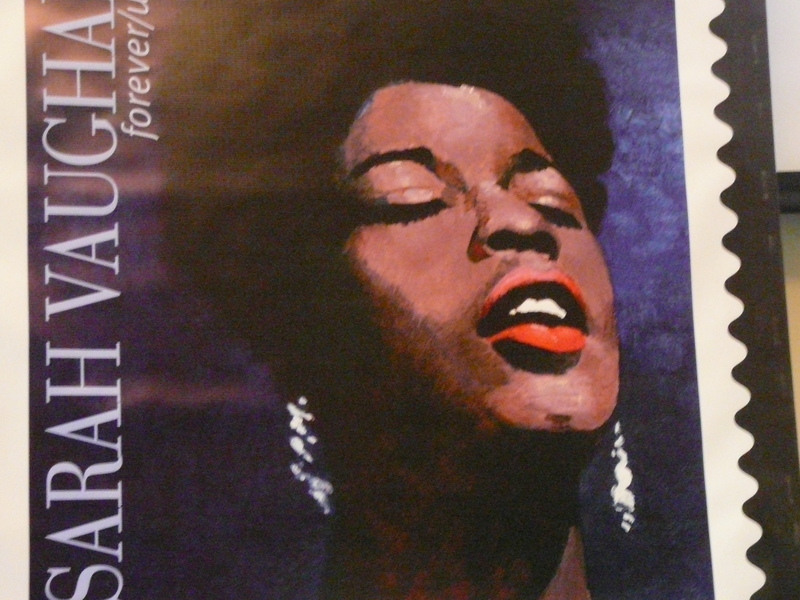 It was fitting that they choose Sarah Vaughan’s stamp for this postmark. She was a native of Newark and Newark will always remember her. It is also fitting that Pillar College not only hosted the event but became a temporary Philatelic Station. The Postal Service hand cancelled postage stamps with Newarks 350th Special Pictorial Postmark. Visitors were assured that they could come back to the college and bring their holiday cards for the post mark. Long live the artistry and memory of Sarah Vaughan and kudo’s to Pillar College for stirring the fire of appreciation for African Americans on stamps. Special thanks to Della Moses for having the vision to help organize this piece of history. You can also read an earlier post that talks about the Bessie Smith Concept Coin designed by Daniel Carr. If you would like to grab one of the Bessie Smith Concept Coins done in 2001 you can get one in auction now. If not, just keep your eyes open for future actions or buy it now fixed prices. 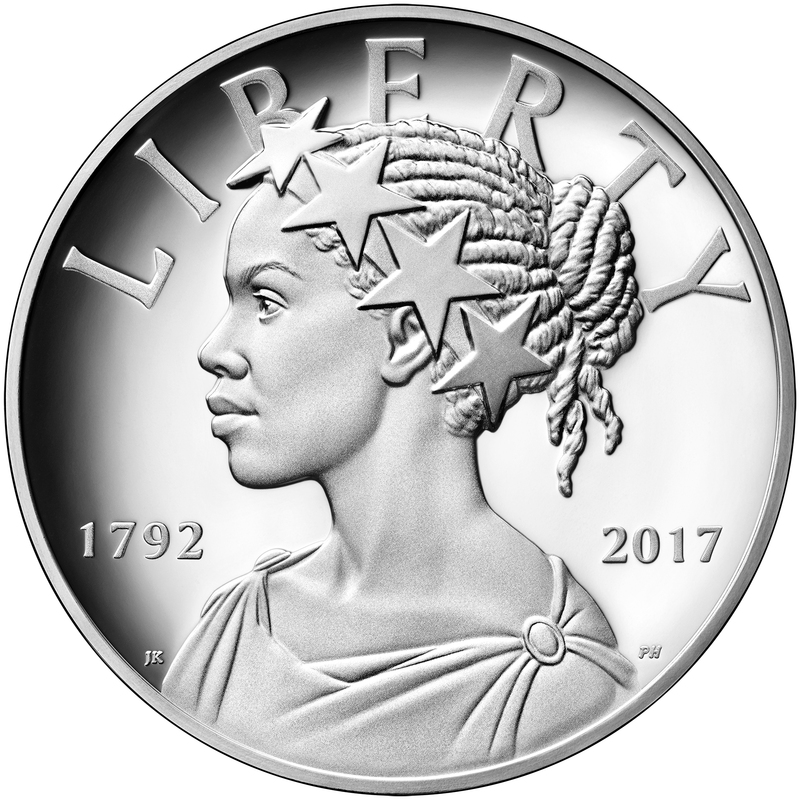 I just hope that Daniel Carr’s coin design gets another view. Perhaps as a medal? If you have a quarter in your pocket right now I want you to flip it over. If it is dated 2009 and for Washington DC you would have the quarter with Duke Ellington on the reverse. A Black History collectible! Now, if you find one and it is in great shape hold on to it. Only 88,800,000 were minted in Denver and 83,600,000 for Philadelphia. Here are some earlier posts about this coin. 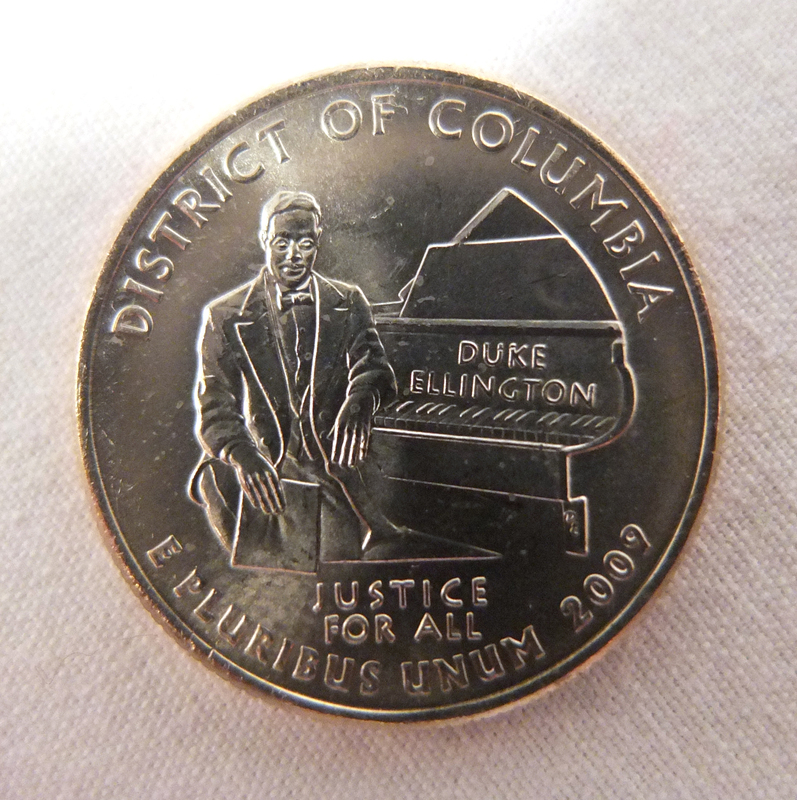 Did You Know That Duke Ellington is on the Reverse of the District of Columbia Quarter? What if Your Duke Ellington Quarter Was Minted in San Francisco? 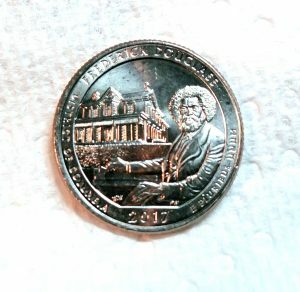 Who Designed the Reverse of the Washington DC 2009 Quarter with Duke Ellington? Washington, DC 2009 minted in Denver. 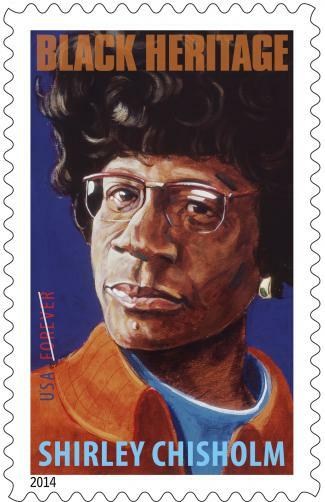 The Black Heritage stamp series just released the Shirley Chisholm stamp. This stamp is the 37th stamp in the Black Heritage series. It features a painting of Chisholm by artist Robert Shetterly. This engaging portrait is taken from a series of paintings titled “Americans Who Tell the Truth.” The Art Director Ethel Kessler designed the stamp. The great thing about new releases is that you can purchase them directly from the USPS website. If you wait and get them later the price may be higher and the USPS may no longer be selling them. Purchase your sheet of stamps directly from the USPS by clicking this link. 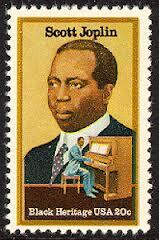 On June 8, 1983, Scott Joplin, known as the King of Rag Time, was honored a 20 cent US Postal Stamp. Jerry Pickney is the Artist for this stamp. There were three (3) stamps issued by the US Postal Service to commemorate baseball giant and civil rights activist, Jackie Robinson. The first stamp was 20-cent issued August 2, 1982. The second stamp was issued on February 18, 1999 and is 33-cents. It shows Robinson sliding on a base. The third stamp is also a 33-cent stamp and shows him fielding. It was issued on July 6, 2000.